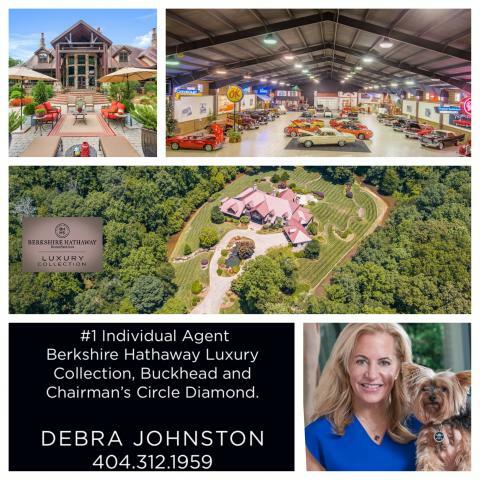 Debra Johnston, named Top 5 Best Agent in Atlanta, offers an exquisite luxury listing that features 446 acres of beautiful grounds and a world-famous colossal car-collector showroom. Debra Johnston, Berkshire Hathaway Home Services Georgia Properties, has announced Georgia’s best custom masterpiece estate. 3509 Tanners Mill Circle offers a range of unique benefits, from a large car-collector showroom to 446 acres of breathtaking picturesque grounds, all available for $16.5 million. The spectacular property and residence are fastidiously maintained to flawless perfection, with luxurious A-Lister features while radiating a friendly cozy feel. Among the 446 acres of rolling hills, there is a variety of lovely scenery to appreciate: from a lake, to natural waterfalls, to winding rivers. All of the previously mentioned can be enjoyed from the home’s extensive wrap-around patios. Debra Johnston is a Berkshire Hathaway Home Services Diamond Member, a recognition only given to half of 1% of worldwide agents. She is also Atlanta’s leading luxury real estate specialist and her extensive clientele network includes relationships with celebrities, Fortune 500 executives, and entrepreneurs. She is known for her genuine enthusiasm for luxury real estate and for her excellent professionalism providing top customer service. Debra Johnston is known as a leader in the real estate field and offers clients maximum listing exposure among buyers and real estate brokers alike. After a record-breaking sales year in 2017, she was named Top 5 Atlanta individual realtor. Representing clients from Los Angeles to New York to Miami, Debra continues to surpass the luxury real estate competition in Atlanta.